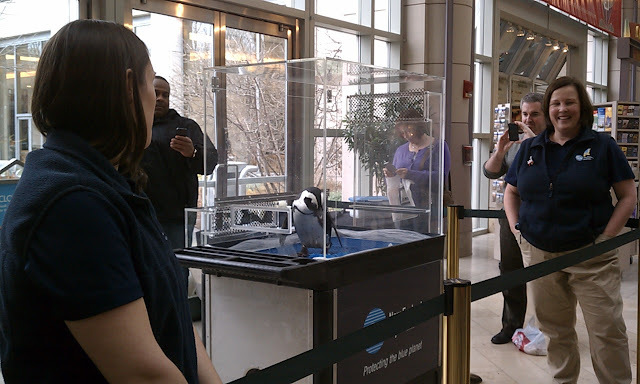 Did you see Roast Beef at the Prudential shops this week?! 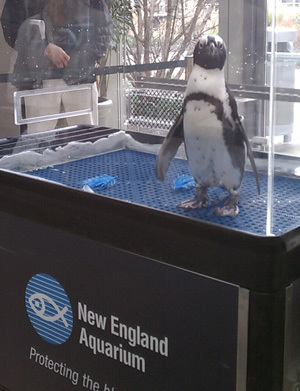 The sociable African penguin from the New England Aquarium hit the town to herald the arrival of the newest 3D flick at the Aquarium's IMAX Theatre—Happy Feet 2! The Academy Award®-winning penguins of Happy Feet have returned with a new film that delights all ages with dancing penguins and a gaggle of new animals. Come by the Simons IMAX Theatre this weekend to follow the fuzzy youngster Erik, who is reluctant to dance like his talented tapping dad. The penguin chick journeys through magnificent frozen landscapes of Antarctica along with some curious sidekicks. Click here for tickets and show times! Roast is an old hand at visiting the sights in Boston. He was the star of the Penguin Pursuit contest during the summer of 2010. When he's nestled into his climate controlled cart, he's quite happy to watch the world go by. You might even catch him tossing around his enrichment toys. If you missed him at the Prudential, come by the Aquarium to see him and more than 80 of his closest feathered friends! Curious shoppers, camera phones in hand, paused to visit with Roast Beef and his handlers at the Prudential this week.